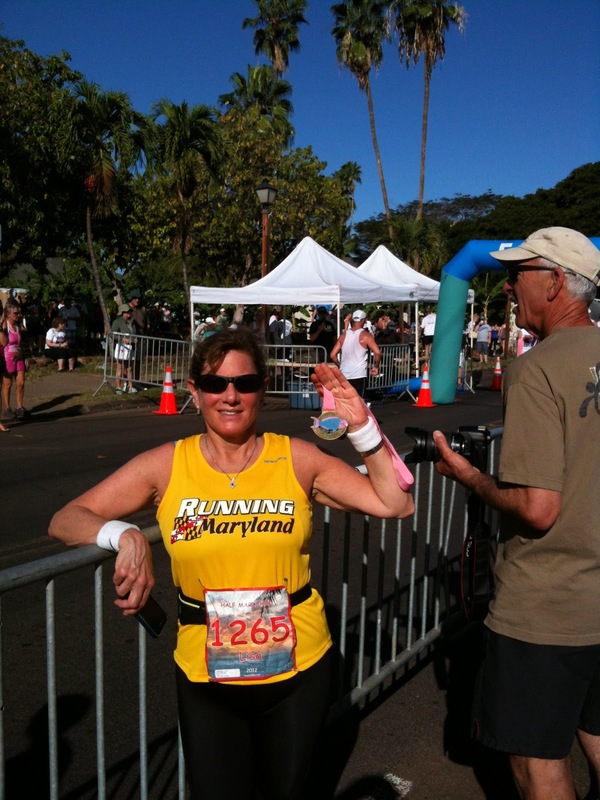 I ran the Maui Oceanfront half marathon on January 22nd. It was my third half marathon and a beautiful one I might add. It was a small race with maybe 2500 entrants. They had a full marathon option as well as a 15K, 10K, and a 5K. The marathon seemed very hilly, but the half was very flat. I also ran a personal best time. The race took place on the shoulder of the main road, along the ocean with cars driving by us. It was very pretty looking out at the ocean while we ran. The course has you run out and back, which was nice because we started and stopped in the same place, unlike the full marathon which has you start in Wailea and end in Lahaina where the half marathon starts. What also seems to be an annoyance is that with the marathon you have to be at the start line by 5:45 because that is when it starts. The half doesn’t start for another hour. They have a walker option for the marathon, but those lucky few have to get to the start even earlier. I wish they didn’t have a walker option because at times they got in the way walking side by side. They instead should have been instructed to walk single file since we were all running on one shoulder. There was plenty of parking and we got there about 45 minutes before it started. The race started before the sun came up and it didn’t shine down on me till I was half way done. 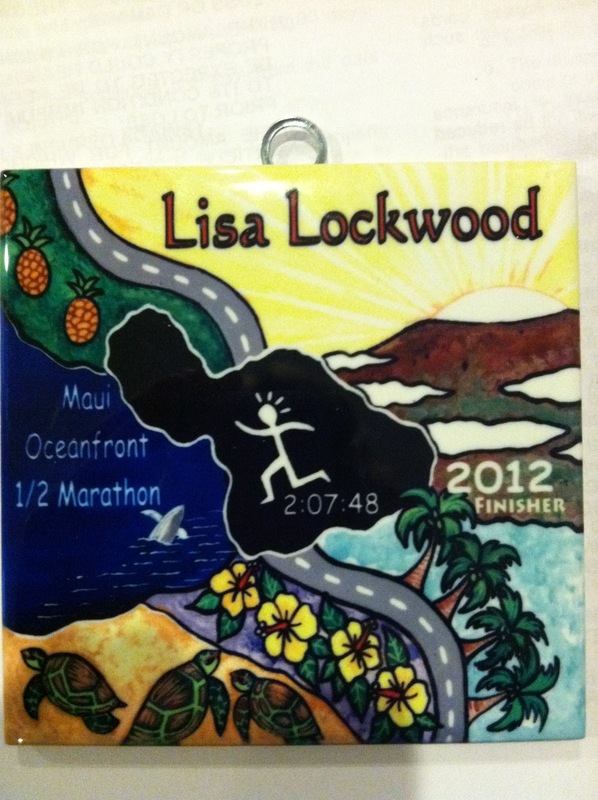 A woman from tropical Tiles and Gallery was selling painted tiles with your name and time on them with a design specially made for this marathon in 3 different sizes. It arrived 2 weeks after the race and I love it. 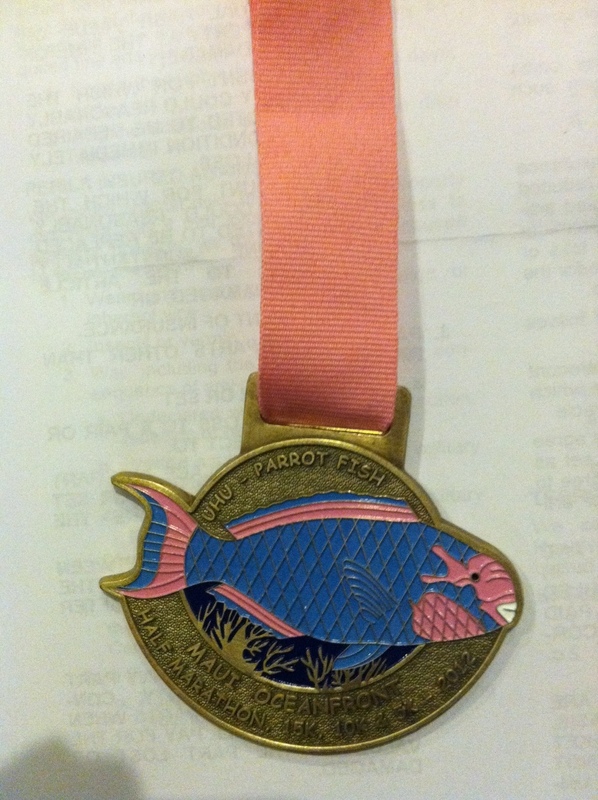 The medal which was average has a parrot fish on the front and turtles with a picture of the island on the back. I would have rather had a whale on it. My bib also had my name on it so they were able to announce me as I was finishing. I came in 5th overall in my age group. Perks: They had a Massage station after the race which was amazing and the line was very short which is always nice. The food consisted of chocolate chip cookies, pineapple, oranges, donuts, Oreo’s. I really enjoyed the fact that they had my name on my bib. There were lots of water stops along the course which was nice as I learned that the marathoners had to go without an aid station for the first 7 miles and on race day it was very hot so I can’t imagine not having lots of water stops. The medal was very pretty, but I’m sure the pink ribbon wasn’t a favorite for some of the men running. It was a beautiful, flat course and while running we saw whales off the coast. I think the coolest part though was seeing the winner of the marathon run by me. Ehh… Not a Fan: They let people swap shirt sizes before everyone picked up their shirt and, as a result, they ran out of some select t-shirt sizes including my boyfriends. However, they did offer him a $10.00 refund or the choice of getting his size in a few months. The shoulder of the road where we ran was not exactly flat but leaned to the side of the road at times a bit more than I liked and some of the walkers decided to walk side by side and get in the way of the runners which was very nice of them (sarcasm) and as a result, we had to run in the street to get around them. there also wasn’t a pasta dinner organized for the night before which was terrible, but I know some people really enjoy going to these dinners. They also had some problems with the timing system, but it was fixed within a few days. Overall, Maui was amazing and definitely worth it. If I can suggest a beautiful but smaller race that runs you along the coast of Maui overlooking the ocean, then go run on the lovely island of Maui.